When I was little I remember listening to a recording of the song “My Dad” by Paul Petersen. I loved this song because it was such a tribute to Dads and its lyrics expressed feelings in a way that I could relate to. I was called “little Mike” until I turned 12 and then as it became more evident that I was a girl, I became Michelle. I have so many wonderful memories of my Dad. I remember Sunday mornings when my mother refused to take me to church because I couldn’t sit still. I stayed with Dad after we dropped mom and my older sister off, and he would end up taking me to Suder’s store to buy me candy necklaces or wax pop bottles filled with syrupy liquid. I couldn’t wait for Saturday night wrestling to be on because even though I was a girl, Dad would let me practice Bruno Sammartino’s latest moves. 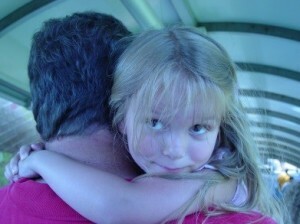 Yes, I was a Daddy’s girl. When our daughter was born, she naturally clung to her mommy. Sometimes my husband would say how she preferred her mommy instead of her daddy. I would knowingly say to him “just wait, she will soon turn into a daddy’s girl”. I knew that when this time came that part of me would miss her clinging but I knew I would be happy seeing her being the way I was with my Dad. This entry was posted in Holistic Nurse. Bookmark the permalink.